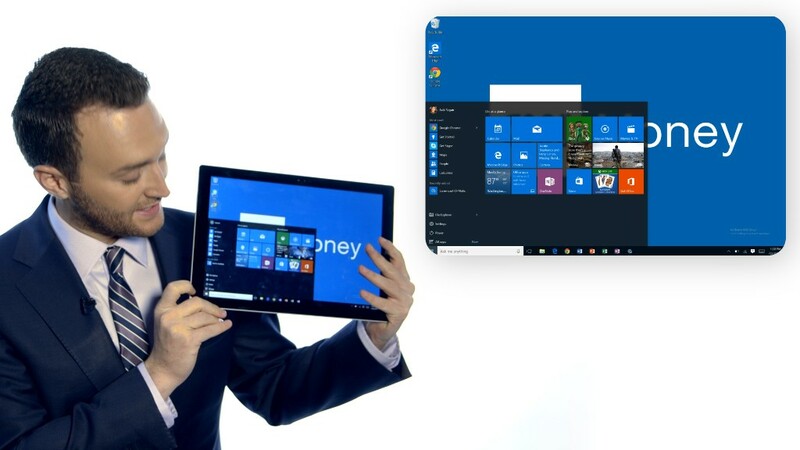 Reviews of Windows 10 have been glowing, but one prominent tech CEO is giving it a big thumbs down. Upgrading to Windows 10 using "express settings" will automatically make Microsoft Edge your PC's default Web browser, even if you used a different browser when your PC was running Windows 7 or Windows 8. You can make Mozilla Firefox, Google (GOOGL) Chrome, Apple (AAPL) Safari or another app your default browser in Windows 10, but it's not as easy or intuitive to do that as it was in previous versions of Windows. In an open letter to Microsoft (MSFT) CEO Satya Nadella, Mozilla chief Chris Beard called that new browser experience "very disturbing." "The update experience appears to have been designed to throw away the choice your customers have made about the Internet experience they want, and replace it with the Internet experience Microsoft wants them to have," Beard wrote. In previous versions of Windows, browsers would prompt you to make them the default app for Web browsing. 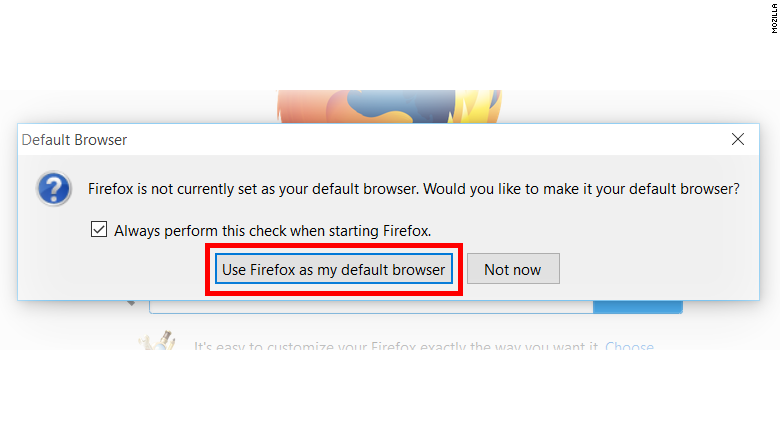 If you clicked "Use this as my default browser," the browser would automatically change your PC settings. You didn't need to do anything else. In Windows 10, browsers will still prompt you to make them the default browser. But then you'll have to manually change your settings. 1) Click the "Use this as my default browser" button. That will launch the Settings app, opened to the "Choose default apps" tab. 2) Click on the Microsoft Edge logo. Picking a browser won't immediately be visible: You'll have to scroll down to where it says "Web browser," and click on Edge -- something Mozilla notes "may not be intuitive." 3) Click on the browser of your choice. 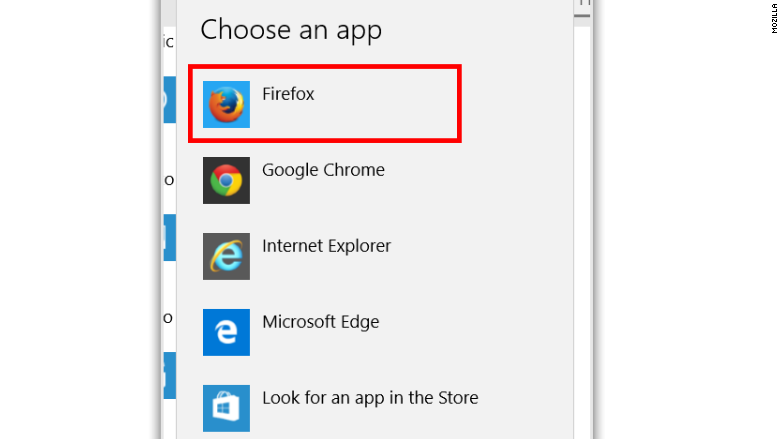 You'll be prompted to choose an app (Mozilla would appreciate it if you chose Firefox, but Microsoft will show you all of the browsers installed on your PC). Close the window to save your changes. It's not exactly rocket science, but it also takes two extra steps (and some hunting and pecking). Millennials aren't going to like that. Choosing "custom" instead of "express" settings during the upgrade installation will also let you choose your default browser. "We designed Windows 10 to provide a simple upgrade experience for users and a cohesive experience following the upgrade," a Microsoft spokeswoman said. "During the upgrade, consumers have the choice to set defaults, including for web browsing. Following the upgrade, they can easily choose the default browser of their choice." Microsoft noted that it is listening to customer feedback and could change the feature in the future. Mozilla's Beard said that he reached out to Microsoft's Windows team when it discovered that Edge was automatically set to the default browser, but that meeting "didn't result in any meaningful progress." Although Beard said he appreciates that it's still possible to choose a different default browser in Windows 10, he laments that the settings "been changed to make this less obvious and more difficult." Microsoft is making a big bet on Edge, the browser that is replacing the much-loathed Internet Explorer. 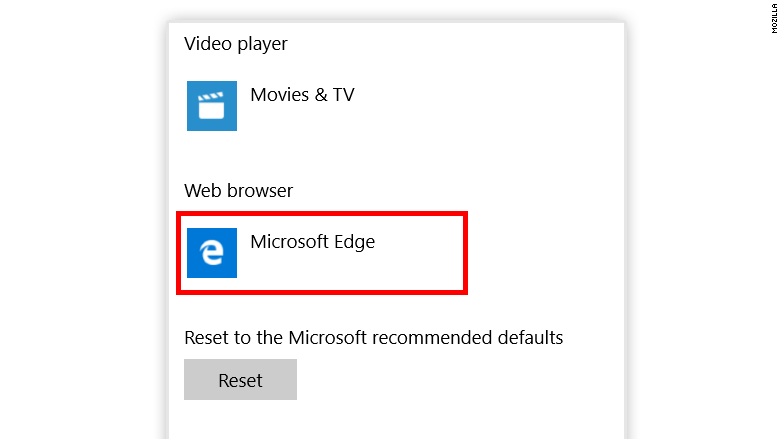 Edge is a lighter, faster, far more modern browser than IE, and it includes some unique features, such as the ability to draw on Web pages and search Bing for definitions by right-clicking a word. Yet overriding Windows customers' existing settings and making Edge the default browser harkens back to the 1990s, when the United States brought an antitrust lawsuit against Microsoft for restricting customers' browser choices. "With the launch of Windows 10 we are deeply disappointed to see Microsoft take such a dramatic step backwards," Beard said. "These changes ... are unsettling because there are millions of users who love Windows and who are having their choices ignored." To spread the word, Mozilla launched a "Ctrl-Z" Twitter (TWTR) campaign, letting you tweet out: "Hey @Microsoft, it's not too late to hit Ctrl+Z. Bring back user choice in #Windows10." Windows 10 became available Wednesday as a free download for Windows 7 and 8 customers. Microsoft announced Friday that Windows 10 had been downloaded 14 million times in two days.